Macaroni Grill’s Chicken Marsala is my very favorite entree from their restaurant. So when I saw this box on the shelf as I was going down the aisle at Wal-Mart, I was excited. However, it turns out it’s not near as good as the actual restaurant entree, and I actually like the Chicken Alfredo boxed meal better. Don’t get me wrong, though, the Marsala is good, but not as good as the Chicken Alfredo. Another thing, with the Alfredo, I can easily substitute the fresh chicken with canned chicken breast if I’m in a hurry and it turns out great. I don’t know if canned chicken would work with the Marsala – I had fresh chicken in the fridge that I used, and I doubt I buy it again to give it a try. So if you try the Marsala with canned chicken, let me know how it turns out. 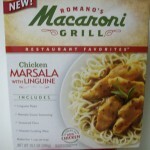 This entry was posted in Recipes &Cooking and tagged boxed meal Romano's chicken marsala, boxed meal romano's macaroni grill, romano's macaroni grill chicken marsala by Charla. Bookmark the permalink.